This blog post is a starting point for food photography. In order to address such a large topic I wanted to show my basic step-by-step process in creating food photography; from set-up, equipment, and final imagery. Hopefully you pick up a new tip, angle, tool and/or perspective for your next shoot. In this post I'll be showing you how to shoot with a pro-level camera and then in a second post how to shoot with an iPhone. I love to use natural light for food photography and since we are focused on the “basics”, it’s the best way to go. Here I moved my table to the sliding glass doors, since it’s my largest light source and I don’t have natural light in my kitchen. It is also important to note that during the making of this blog post I started my photo shoot at 2:30 and captured my last image at 4:00. The light was dropping significantly and you should consider this when shooting your own images. Here is an overview shot of what tools and gear I’ll be using for this “basics” food photography shoot. Foam board: Used to bounce the light back onto the food from the windows. Step stool: When taking overhead images it’s nice to have some height over the food or sturdy table to stand on. Multiple Surfaces: Wire Rack, Cutting board and Marble will provide some variety. Let’s Start Baking and Shooting! To keep with the “basics” theme I wanted to bake chocolate chip cookies to demonstrate various type of images one could capture. First, you have the ingredients, next the raw cookie dough, and finally the baked cookies. 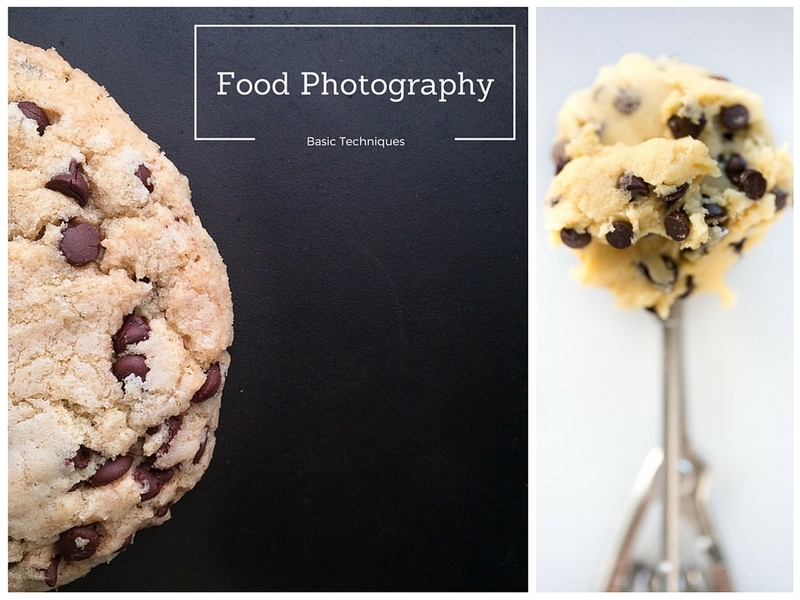 Lets look at these three baking steps in terms of photography. Notice the position of the window light and the foam board reflector. You will see the set up used many times. I am using the foam board to reflect the light back onto the surface and open up the shadows. When photographing ingredients, it’s nice to display them in an organized manner and in similar or same containers. Using a contrasting surface helps the ingredients pop as well. I also did not use the full quantity of each ingredient; otherwise the image would be too crowded. The natural light coming through the window was moving during set up, so I positioned the foam board to the right of the scoop to reflect the most light onto the subject. I wanted to create a detail image with the cookie dough and scoop. I also knew I wanted a lot of “drop-off” from the focal point I chose and used my 100mm F2.8 lens. My focal point in this image was the top of the dough and so the metal scoop and remaining dough would not be in focus, this is my creative approach to the subject matter. The post-production of this image was simple in Lightroom software; I opened up the shadows and made the white paper pop a little more using the selective tool. I wanted to change my perspective so all the images were not captured from an overhead angle. Since I was shooting into my light source, the window, I had to bounce light back to the dough. In the set-up image you can see how I am moving the foam board to light the area needed for the image. When I set-up this image to shoot I really loved the lines of the scoop. There was something architectural about the design and I was able to highlight that more when I changed my perspective. The dough was placed in the scoop in a natural way, but one could have created a perfect dome, again creative choice. My post-production process was simple, again just opening up the shadows in Lightroom to make the image a bit brighter. I wanted to capture both a light and dark element in one image. The cookies sheets with different liners provided this opportunity. I pushed the sheets closer to the window since the light was still dropping and the foam board was used in the same manner as the other images in this photo shoot. The cookie dough balls had to be symmetrical in order to make this image work. It would not be balanced to the eye otherwise. This means both the placement and the size of the balls had to mirror each other. My post-production process consisted of cropping, rotating and opening up the shadows to brighten up the image. This was my last shot of the day taken around 4:00. Because of this I had to add in a second foam board. I was also shooting towards the sliding glass door so more light was needed. This image can be captured both landscape, as shown, or portrait. Since this blog post has scoop images are both portrait, I wanted to add another landscape. The 100mm lens was great for this image. The lens worked well focusing on the details of each cookie and dropping the background out of focus. Shooting this at f 4.0 helped to keep most of the cookie in focus vs blurring out most of the cookie at f2.8. Post-production consisted of opening up the shadows in Lightroom and making sure the stack of cookies was straight. Stay tuned on Friday for the follow up blog post and learn how to do food photography with your iPhone!